Salaries made modest gains, but a loosening employment market and PR's rising influence fueled competition for the industry's brightest talent. Hiring and salaries are making modest gains, but a loosening employment market and PR's rising influence are fueling competition for the industry's best, finds the PRWeek/Bloom, Gross & Associates Salary Survey. If you wanted a raise last year, you likely got it. And if you have expertise in a vertical that performed well despite economic turmoil, such as healthcare, or if you can combine solid traditional PR skills such as cold pitching reporters with digital storytelling, you might want to take that recruiter's call because he or she probably has a few offers to throw your way. This year's annual PRWeek/Bloom, Gross & Associates Salary Survey, which polled 1,567 PR professionals across the US, shows that hiring in the communications sector remains moderate and cautious, but companies aren't hesitating to bring on key players as they are able to find them. That means the industry is gearing up for a potential talent war over its biggest superstars. Last year took everyone on an economic roller coaster. It started off great – Goodbye 2010. Hello rebound! But then – Oh wait. Congress can't pass a budget. Standard & Poor's downgrades the US for the first time in history. And what the heck is going on in Greece? But as unemployment in the US continued to trickle downward and home prices began to show some limited improvement, a cautious optimism has once again settled over the business community as a whole. Communicators, too, predict 2012 will be a good year for them. "We definitely saw improvement in 2011 over 2010," says Tony Sapienza, cofounder of the technology- focused Boston boutique firm Topaz Partners. "We're feeling more confident coming out of 2011 and entering 2012. I don't think we're feeling as confident as five years ago, but there's definitely improvement." On the West Coast, Waggener Edstrom Worldwide's talent acquisition manager Jodi Moore notes that while global headcount has remained relatively flat to slightly up, "we have continued to invest in strategic hires. "When we find that talent, we need to be able to bring them in and integrate them into the agency," adds the 9-year agency veteran. "It is such a war for talent out there and it is so imperative for any company to retain your best and brightest." Employees recognize the momentum. The survey found that more PR pros (37%) are searching for their next job than in all the years of the Salary Survey. There are fewer layoffs and less downsizing going on around them, which is also fueling confidence. An examination of the last seven years of survey data shows downsizing peaked in 2009. For the first time in the four years since PRWeek began asking whether or not respondents would be willing to take a pay cut or salary freeze to ensure job security, more than half of the industry said no. "We're already seeing this year that people are much more receptive to having a conversation about new opportunities," says Karen Bloom, principal at Bloom, Gross & Associates, a Chicago-based recruitment firm in its 24th year of business. Lisa Reilly's career has spanned the advertising and communications fields, various verticals, as well as agency and in-house roles. For the last few years, she has run the communications and advertising function of MassMutual's retirement services division, which offers 401Ks and retirement plans at companies, as a one-woman band. Reilly initially joined in 2005 as the division's first PR lead and later took on oversight of advertising as well. She "likes the diversity of the role," and values the growth opportunities, as well as the strong benefits package and monetary rewards that come from working at a "financially strong company such as MassMutual." Reilly agrees the PR market is loosening now and senses more movement among her talented job-seeking peers. "It's a great market for PR right now," she says. "The people who are still in a company today have been identified by leadership as high performers. They have shown their commitment and hung in there through tough times as jobs have been consolidated and eliminated. They've taken on more responsibility. There is a threshold. People are feeling, ‘I've shown my commitment and it's time the company recognizes' – you can only get so much out of so many hours of the day." Recruiters continue to call the industry's best talent, some of whom are beginning to pick up the phone. One Salary Survey respondent who preferred not to be named says she has begun asking recruiters to assess her current salary. "They have told me that I'm on the lower end of the pay scale," she relates. Waggener Edstrom's Moore says the competition for top talent has increased – and it's not just other agencies she is fending off. "Talent is feeling more comfortable and confident," she explains. "What we're seeing is if they have our offer, they probably have one or two other offers, too. It's not just PR agency going against PR agency. We're seeing a lot of competition from in-house – companies such as Google that are going after the AEs and SAEs." Despite several rocky years of global economic turmoil, Bloom says "compensation has stayed fairly consistent" and she has seen continued "small increases" in salaries based on the offers her team delivers for clients. 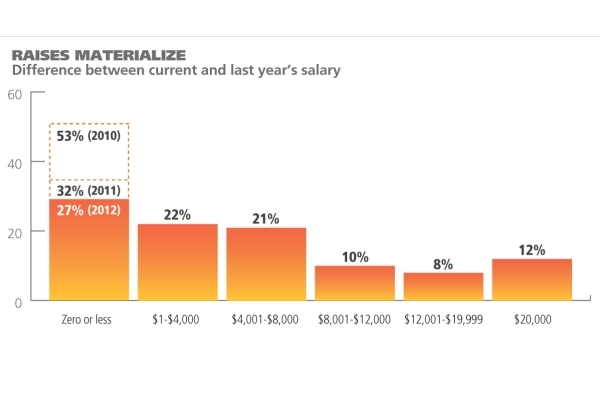 The median PR salary rose to $90,000 in 2011, up from $82,000 in 2009 and a near return to 2005 levels of $92,100. It makes sense then that raises have bounced back, too. 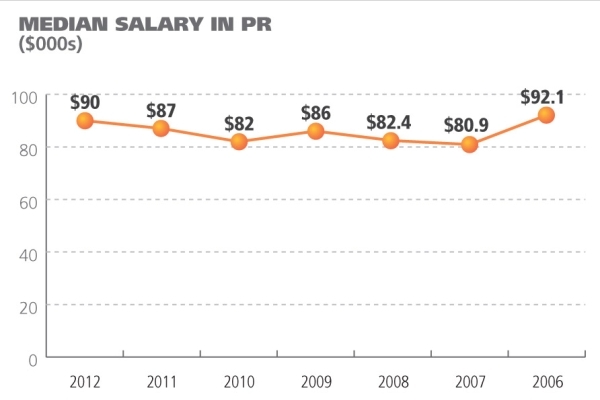 The number of employed PR pros who did not receive a raise last year fell to 27% from 32% in 2010 and 53% the prior year. In fact, 43% of respondents received a raise in their salary of between $1,000 and $8,000. Another 30% received a minimum $8,000 bump. Not surprisingly, those working in lucrative industries tend to be the highest paid. PR professionals at financial services companies have the highest median base salary at $120,000 a year, followed by the technology industry at $115,000. Salaries for in-house PR pros tend to skew slightly higher than those at agencies, while both typically pay base salaries above those working in nonprofit PR. The median salary for a corporate PR pro is $113,000; $81,500 at an agency; and $70,000 for those at nonprofits. Those working in PR firms were the most likely to see a raise of 10% or more last year. Agencies also say they will hire more rapidly in 2012, compared to more incremental, gradual goals of corporate PR departments. The survey found 65% of respondents with hiring authority or knowledge of a corporation's in-house PR team expect headcount to stay flat. 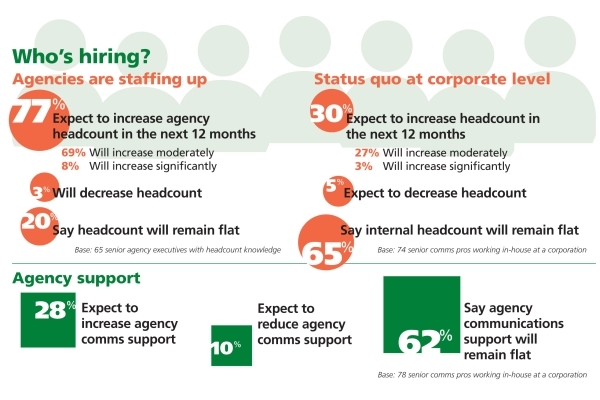 In contrast, 77% of those with hiring authority at agencies expect to increase headcount in the coming year. "We've reached a point where we're able to more freely recruit because business in general, and our industry, is starting to be more optimistic," says Alan Weatherbee, VP of HR at Cone Communications, a midsize Boston-based Omnicom firm. "Even in the down economies 24 months ago we were still able to experience some growth." In agency land, hiring ebbs and flows with accounts, as well as regional growth strategies. Claudia Patton, global chief talent officer at Edelman, says her firm is constantly on the lookout for the right candidates so "we can move quickly to hire when the next immediate need arises." When the independent giant created a mini-conflict agency earlier this year to service the newly won Kellogg account, it had an immediate need to hire in the Midwest. When it won the Tata account in India last year, "we had to hire over 125 people in a very short time," she says. It is possible 2012 will be the year when PR agencies begin to hire big again in the US – if the economy continues on an upward trajectory and if organizations keep investing in their communications function as they have in the last few years. However, it seems probable the industry will stay on a more modest expansion path. Negative macroeconomic trends, particularly concern related to continued troubles in Europe, remain and the beginning of 2012 seems to indicate another roller coaster ride. In late January, consumer packaged goods behemoth Procter & Gamble said it would lay off 1,600 non-manufacturing employees and its second quarter profit fell nearly 50% year over year. Days later, American Airlines said it could eliminate upwards of 13,000 jobs as part of its bankruptcy restructuring. Closer to home, layoffs recently took place within the marketing services divisions at companies such as Microsoft and Kraft, as well as at digital and ad agencies, including Ogilvy Group, Saatchi & Saatchi, Wieden+Kennedy, and MDC's Crispin Porter & Bogusky, according to industry reports. In this environment, it's not surprising that lean efficiency is still the prevailing trend in most corporations' communications departments. "Unless you're talking about a company going through a tremendous growth spurt, you are going to stay fairly conservative until you see we are really on the right track and things are picking up," suggests Bloom. Senior communications executives at companies as diverse as Kellogg, DHL, MassMutual, and Thomson Reuters say 2012 PR headcounts will remain flat to slightly up in the coming year. Many of them say internal communications staffs have grown, oftentimes multifold, over the last five to seven years, but it has frequently been by only one or two heads each year. "We've added headcount over the past five years, but I would call it very modest," says Kris Charles, VP of global communications and philanthropy at Kellogg, where she oversees a 27-person communications staff at the company's Battle Creek, MI, headquarters. "Kellogg is a lean organization and we pride ourselves on that. It's a key to staying successful over time – keeping your team lean, but also appropriately staffing." At the start of the year, Charles was actively recruiting for three roles, one of which was a newly created post. Since Christine Cea joined Unilever's brand PR team in 2006, her group has doubled from five to 10 as the function assumed greater responsibility. Cea, who is now director of marcomms with oversight for PR, social media, and health and wellness marketing for the company's US food and personal care brands, helped Unilever build out its marcomms capability. "We've done that by enhancing the value of PR through expanding with social and also extending into other key areas of the company, creating a holistic department for marketing communications," she notes. "Even with the growth of our group, we are still very lean," Cea adds. "We have and continue to rely extensively on agency partners." Reliance on firms and part-time consultants has increased over the last couple of years in an era of uncertainty, says Jennifer Pakradooni, director of communications in the Americas for DHL Global Forward, the freight division of shipping and logistics firm Deutsche Post DHL. "We operate on very thin margins, so it's more cost-efficient for us to be able to tap into suppliers and contract work," she explains. "We were hiring until the fourth quarter," Hunt adds. "Thomson Reuters is changing the business and the makeup of how the company reports. We're going to a flatter structure across the business." At MassMutual, Reilly's management approved one additional employee as the retirement division expanded, but she shares her part-time with another department. A couple of new hires are expected within Michelin North America's communications team this year as it continues to fill in a restructured department. "We're trying to beef up our internal resources, organize more holistically, and look for synergies," says Lynn Mann, director of external communications in North America for the tire brand. When Mann began at the Greenville, SC, company 12 years ago, she was one of two PR managers. Her team grew quickly to five and then 12. It avoided layoffs during the downturn, but "did take a pause [in hiring] as everyone did at the end of 2008 and 2009. Where we had normal attrition, we did delay backfills and used some contractors." The group recently reorganized into three practice areas – consumer, commercial, and corporate – which opened up new jobs, including entry-level roles more typically seen at an agency than on the in-house side. "One reason we did it is because it creates a career path inside the department so someone can grow and move within it," says Mann. While nonprofits might pay lower salaries in general, they compete for PR talent in other ways. Emily Callahan's career began at a PR agency, but it was in nonprofit communications where she found her niche – first at Susan G Komen for the Cure, where she led PR, then brand marketing, and later operations for individual affiliates. As CMO for ALSAC/St. Jude Children's Research Hospital, a role she's held since October 2010, Callahan has helped grow and formalize the marketing function into six divisions where communications is her third largest. "We find a lot of people who want their career to matter. They want friends and family to be proud," she explains. "It does not mean we can pay them peanuts. We still need to be competitive in salary, have a great benefits package, and be able to tell them you'll foster your career here." Callahan's 170-person marketing team and 25-person communications staff matches the largeness of the organization, which raised more than $700 million last year. Smaller nonprofits, though, say they compete with similar ammunition. Katherine McLane, senior communications director at the Lance Armstrong Foundation who once served as a spokeswoman for former California Gov. Arnold Schwarzenegger and later as press secretary for the Department of Education under President George W. Bush, says she got the "cause" bug early on. "I didn't want to spend my life promoting a product I didn't have a deep emotional investment in," she says. "Serving people and families affected by cancer is a reason to get out of bed every day. People working here believe in the mission." Beyond fair pay, interesting work is a common motivation for recruits to both agencies and corporations. The average work week for a PR pro continues to hover around 50 hours and vacation at 16.5 days, finds the survey. Respondents still say it takes a 20% raise to motivate them to consider a new job. Recruiters, however, cite intangibles such as more interesting tasks or a bigger brand as factors that truly woo talent to a new gig. "It's really more about the excitement factor – a bigger team, closer access to the CEO, a sense of pride," says Bloom. "If it's no different from what they do now, it won't interest them even if the money is more." Agencies and corporations alike continue to dangle sabbaticals, flex time, and rigorous training and advancement opportunities as not just enticements, but also retention tools. "We have a competitive compensation and benefits package," says Kellogg's Charles. "But it also has to be about engagement, feeling valued and part of a team, being in a function valued by the company, and having challenging, exciting, and varied work over time." What hasn't changed in the last few years of the Salary Survey is a continued thirst for digital talent in the PR industry. Nearly every PR hiring manager would agree with how Edelman's Patton summarizes her most pressing skill set hiring need: "Digital ASAP in every office." Those interviewed also requested deep vertical know-ledge in some instances and well-rounded integrated channel experts in others. Cone's Weatherbee says he's looking for "really strong directors who can run accounts and have business acumen," while Waggener's Moore is developing bench strength at the account coordinator level through a robust internship program. Bloom believes the diversity of job needs in the communications industry is a positive indicator. "It truly is running the full gamut," she says. "I take that as a good sign because it means we have a healthier market with all the areas growing, as opposed to filling in a need." The PRWeek/Bloom, Gross & Associates Salary Survey was conducted by Bovitz Research Group. Email notification was sent to approximately 50,171 PR professionals and a survey link was posted to PRWeek's website and social media pages. A total of 1,567 PR professionals completed the survey online between November 29 to December 21, 2011. Results are not weighted and are statistically tested at confidence levels of 90% and 95%. This article offers a summary of findings. Additional charts and findings are available for purchase in the premium edition of the Salary Survey at prweekus.com/salarysurvey.